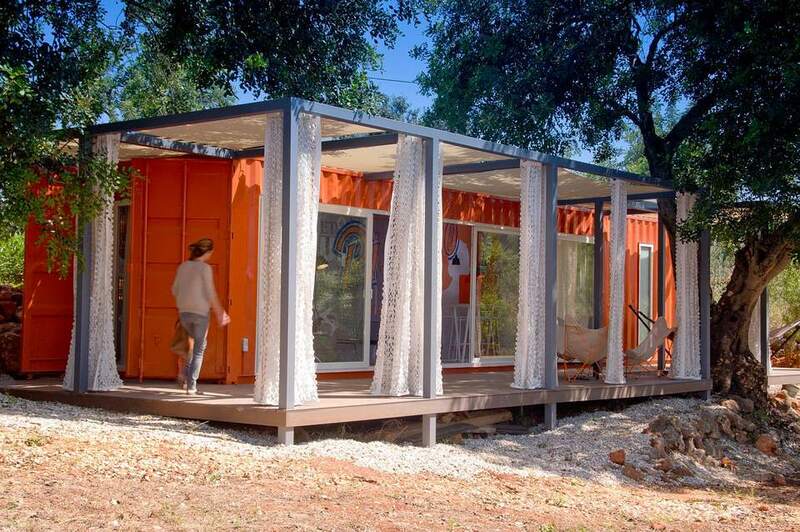 This bright orange abode, called Nomad Living, is a vacation home prototype by Studio Arte. It's a modular dwelling that cost under $50,000 to build, and it was constructed using a single shipping container. This small space seems to have everything you need in a summer retreat including the perfect location. It's in Algarve, Portugal, which is a desirable and affordable beach destination. If you want to see more of this shipping container vacation home read on. This uncluttered indoor space seamlessly merges with nature thanks to the glass sliding doors. When the doors are closed, the entire place has a gorgeous view. When the doors are open, the living room becomes an extension of the home's deck. The wood deck practically doubles this container home's square footage since it runs the entire length of the dwelling. The curtains are a great touch that provides privacy. Sunlight and large windows make small spaces feel like much more prominent places. Large glass doors open up the indoor dining area. The deck curtains carve out a spot perfect for napping or working. A free-standing hammock can be a great piece of small space furniture that won't fall. You can also take it apart for and store when summer is over. But not as quickly as this cool chair. You can buy them cheaper, on average a used shipping container costs between $3,500 — $7,000. When it comes to elbowroom, a 40-foot container will give you about 320 square feet of floor space.